Product Introduction Pure BLACK Belly Warmer | Threehills CO., LTD. Characteristic far infrared rays emitted by Pure BLACK gently relieve feeling of cold around the abdomen and waist. 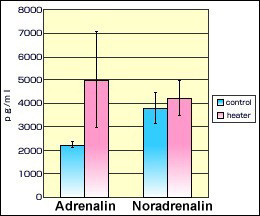 Increased adrenaline secretion puts the body into an active mode, preventing you from snoozing. "Pure BLACK" has acquired a patent for the function of prevention of snoozing. It was clarified through the research conducted by University of Tokushima that characteristic far infrared rays emitted by our Pure BLACK-applied products raise both adrenalin and noradrenalin levels, thereby putting the body in a more active mode (fight or flight mode). They are highly effective for the types of work requiring concentration of mind and sports. Please click here for more details on Pure BLACK. Hiroshi-kun, who never compromises, has been engaged in research and development on this over a long period of time. As the result of his tenacious pursuit of a safer and higher-level characteristic far infrared ray technology, he has been successful in independently creating a new material, Pure BLACK. Copyright © 2011 Threehills Co.,Ltd. All Rights Reserved.